Yawn. Afternoon blogging. Meh, best I get back into the swing of things. Nothing very exciting to report ... Haven't seen much of Varen this week as he's played soccer on 2 of the nights (Monday & Tuesday) and I had Poker with the girls last night. Which is the reason for the yawn ;) Although I slept great last night ... the night before, however, was a completely different story. I had weird and awful dreams. Dreams that gave me an icky feeling in the pit of my stomach when I was trying to go to sleep the next night (last night). Dreams that left me exhausted when I woke up. Generally I'm not a big dreamer, but for some reason when I over heat at night, I see to have really crazy dreams that I can remember. Ps. 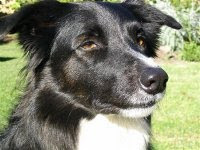 Yesterday my folks had to put down our 11 year old Border Collie boy (Fizbin - don't ask, the name came from some elf in a flash game! Haha). Love you boytjie. Now that may not look like such a good photo of him ... being a peculiar angle and all, but actually, it's a *perfect* photo of him. It's him in his absolutely favourite spot, "herding waves", on the beach, in front of our holiday house in Cape Town, where he spent his first 3 weeks with us (he was actually born on the Cape Point Ostrich Farm). 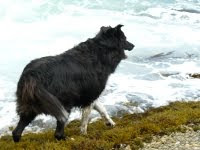 He used to make such a racket barking at those waves and get himself soaking wet running into the water to rip up seaweed (dunno if he thought he was saving it or what? ), completely exhausting himself running up and down (as long as someone would sit there watching him). *sniff* Good memories. Update 08-11-2009: Added that better photo of my lovely boy up at the top after Mom mailed it to me. Such a gorgeous boy! Sorry to hear about your Fizbin :-( Glad you have awesome memories of him.